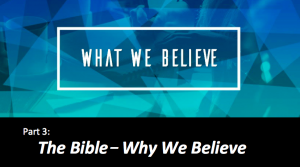 This week we continue our series called What We Believe. The Bible, consisting of the Old and New Testament, is the inspired Word of God, inerrant in the original documents and of final authority in all matters of faith and practice. What does that mean exactly and why do you think it’s true?